Perhaps the most disturbing fact is that politics has become increasingly personal. We don’t see those on the other side as well-meaning people who happen to hold different opinions or to weight conflicting goals differently. We see them as unintelligent and selfish, with views so perverse that they can be explained only by unimaginable cluelessness, or a dark ulterior motive. Either way, they pose a grave threat to our nation. 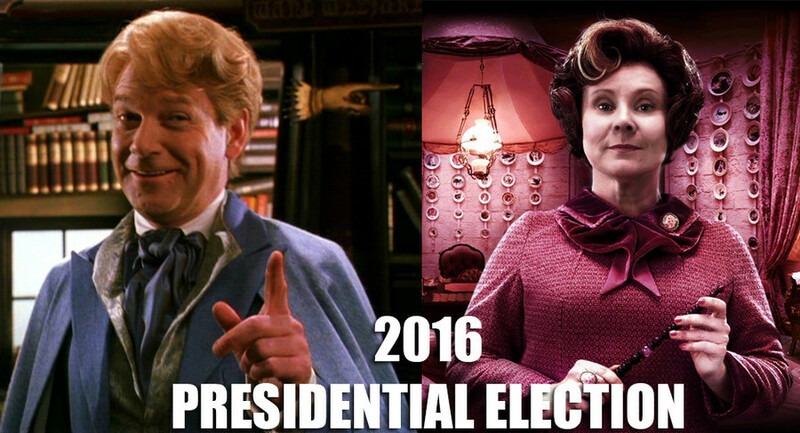 This political meme compares Donald Trump to the Harry Potter character of Lockhart and Hilary Clinton to the Harry Potter character of Umbridge. The 2016 United States presidential election was a highly polarized race, with bitter diatribes aimed against both of the major candidates which were selected by the two major political parties. In fact, both of the main candidates were unusually unpopular with the general populace. According to the statistical data gathered by Real Clear Politics that year in late October and early November of 2016, 54.4% of Americans viewed Clinton in an unfavorable light and 58.5% viewed Donald Trump in an unfavorable light. More than half of the population disliked Trump, and more than half of the population disliked Clinton. Those who considered voting for a third party representative though would be told by Trump opposers that a third party vote was a vote for Trump, and by Clinton opposers that a third party vote was a vote for Clinton. Clearly, both cannot be true at the same time, but the fact that people believe it to be true is an interesting statement about society. The political meme to the side was not atypical of the months leading up to the 2016 election. The meme makes some visual humor, comparing the appearances of the two politicians to the characters from the Harry Potter franchise, but it also makes a political statement that Trump is an undesirable candidate because of an implicit comparison to his intelligence and that Clinton is a similarly undesirable candidate because she is untrustworthy and is an unpleasant person behind her facade. How did we develop a culture that expects and accepts only two options for political leaders? Why do people feel the need to choose the lesser of two evils? How did we become so locked into the two-party system that we see any alternatives as impossible? It’s a long, complicated story, with no one single answer or even a single beginning, but one beginning was in England during the seventeenth century with the rise of the Whig and Tory parties. These parties set a precedent for two-party systems that would, perhaps unconsciously, inspire the formation of the two-party system in America. Over the years, the two-party system has become traditional, despite occasional deviances from the norm when one party dominated or a third party cropped up. Despite the issues associated with the two-party system, such as bitter partisanship, the two-party system provides America with a stable balance of power. “Election 2016 Favorability Ratings.” RealClearPolitics. www.realclearpolitics.com/epolls/other/president/clintontrumpfavorability.html. Memes are difficult to trace back to their origins. The furthest back I have found is an imgur account which gives earlier credit to @WREP.